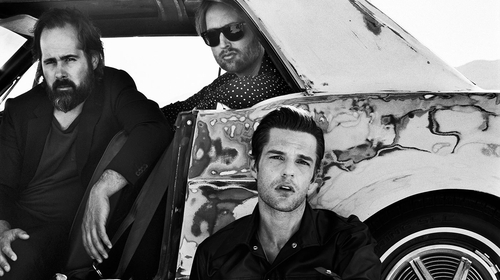 The Killers have joined the growing ranks of pop and rock acts to voice stinging criticisms of US president Donald Trump with their latest single. The Vegas band has released Land of the Free, their first new track since the Wonderful Wonderful album in 2017, and it's a full Springsteen goes gospel ballad in which a saddened Killers frontman Brandon Flowers laments the current political climate in the USA under Trump’s administration, including the proposed wall at the Mexican border, gun control laws, and the black lives matter movement. The video for the song, which was directed by Spike Lee, includes footage of migrants at the US/Mexico border. Speaking to radio station Beats 1, Flowers said, "I think it’s a very important time right now. It started in my mind, around when [the] Sandy Hook [shooting] happened and as a father, how that affected me and then it just started stacking up. "It was things like Eric Garner, Trayvon Martin, things like what’s happening at the wall. This stuff didn’t seem to be in harmony with the values that I believe my country was founded on." He added: "I would start the song and then I would put it away and say ‘I’m not the guy to do this. I feel inadequate, someone is gonna write this song’ and then it just piled up with Las Vegas, Orlando, Parkland [shootings]. "It just kept coming and I just thought , ‘I have to get this out’. The band also released a lengthy statement about the track on their Twitter page.